How to choose the right Bedroom Storage! 5 Elements that you need to consider in your Bedroom! Following on from last weeks newsletter, I want to look at bedroom storage this week. This is an area that is often over looked or not really considered and planned properly. Storage is one of the most important elements in our homes and it needs to be considered carefully in every room, not least the bedroom. So how do you rid your bedroom of clutter and choose the correct type of storage for your bedroom? As with planning a kitchen, you need to look at what you need to store. Do you need more hanging space, or do you prefer to fold everything and put them in drawers or shelving space? If you start from scratch, then you can really choose the best option for you, whether that’s open or closed storage, free standing or built in. Most bedrooms will benefit from fitted furniture. If you have the option in selecting the design yourself, then you can really tailor it to you needs. 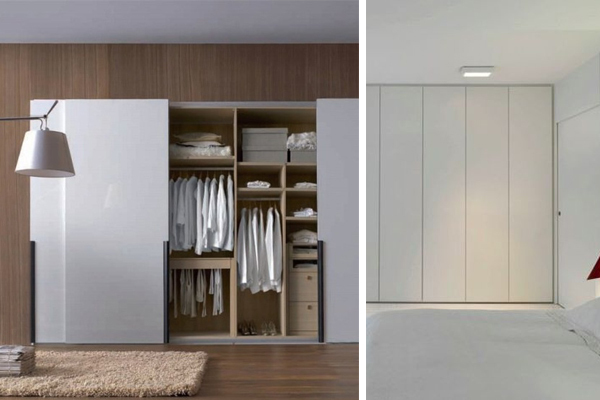 The wardrobe can also be designed and fitted into awkward spaces, such as angled walls or alcoves. There are a huge amount of clever storage options now, so do your research and choose the best options for you. 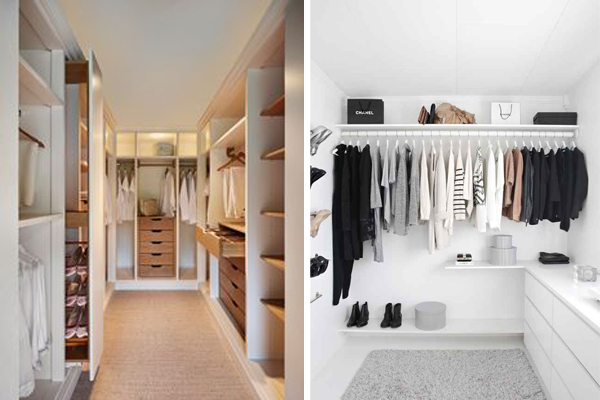 L-shape bedrooms can lend themselves very well to a dedicated wardrobe area, so you could opt for a walk in style wardrobe if this is the case. Open storage is very useful and can lend itself to being a more practical storage space. However, if it is on view from the bedroom, then you may need to be close if off with a screen or partition wall if you need to hide the mess…. Underbed Storage is hugely rated and can be very valuable storage space, particularly in a smaller room. Depending on the type of bed that you have, there are a few options. 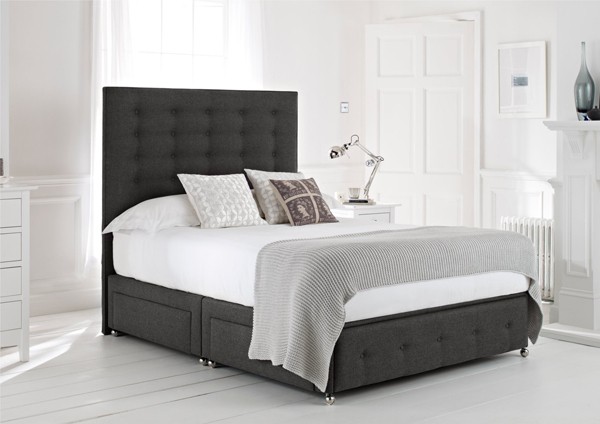 A standard divan bed base, comes with drawer storage options which will give you 4 good sized drawers. However, make sure that you select one that comes upholstered in a plain fabric, as if you have to use a valance sheet, it makes the drawers difficult to use. 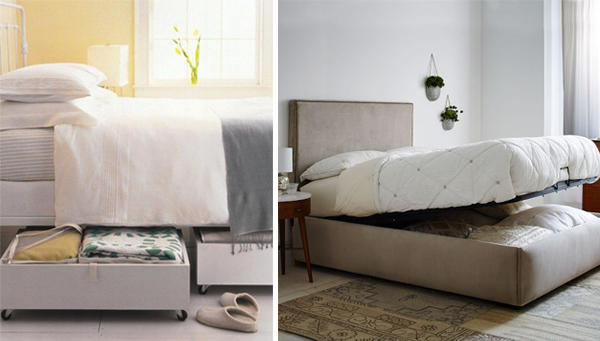 If you have a standard bedstead, then large underbed baskets can be used to give you additional storage. Ikea have a really good range of these, so check them out. There is also the lift up bed, which is not so readily available. The entire slatted base lifts up from the base, to reveal a storage area the size of the bed. It is more awkward than drawers, but is great for storing items that you wouldn’t need access to all the time. 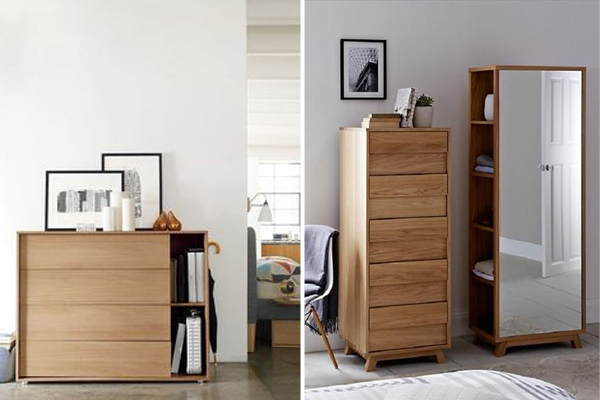 Whether you are considering a chest of drawers, bedside tables or a free standing wardrobe, all of these can be good options, if you do not have adequate storage or space in a fitted wardrobe or your room. Chest of drawers can be a fantastic option if you are good at folding your clothes and putting them away, but they can also be a hindrance, if you just through things into the drawers and would be better with more hanging space. So, what you really need to determine are your needs. Do you prefer to hang items or fold them? Do you have lots of shoes and handbags with nowhere to store them? This will really help you to determine, what is the best type of storage for you.